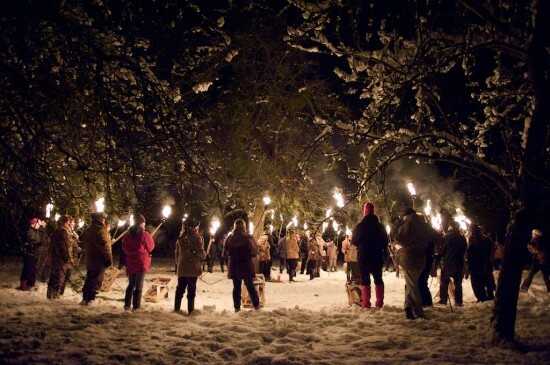 Usually a very good Wassail evening at Barrington Court Somerset. Having just read your selection of Wassails for the New Year, I would heartly recommend the Wassail at The Fleece at Bretforton, near Evesham, Worcestershire as being pretty special. Firstly the setting is unique as the pub has hardly changed for several generations – it is now owned (but not operated) by the National Trust. They have a great old barn from which they serve food and drink. Lots of impromtu singing continues and fiddling etc occurs here! There is a great turnout of Morris sides who dance their stuff, (plus lead the Wassail ceremonies)and a good turn out from the general public which gives the whole event a great atmosphere. I attended last year with friends and a cider client of mine and we both thought it was a great night out! I would NOT recommend Carhampton, even though it’s the most well known. Last time I went they were burning an old kitchen on the fire!? The cider was awful and they didn’t explain the ritual for newcomers.